Peganum harmala, commonly called Esfand, wild rue, Syrian rue, African rue, or harmal, is a plant of the family Nitrariaceae. It is native from the eastern Iranian region west to India. Its common names refer to its resemblance to rue (which is not related). It is a perennial plant which can grow to about 0.8 m tall, but normally it is about 0.3 m tall. The roots of the plant can reach a depth of up to 6.1 m, if the soil where it is growing is very dry. It blossoms between June and August in the Northern Hemisphere. The flowers are white and are about 2.5–3.8 cm in diameter. The round seed capsules measure about 1–1.5 cm in diameter, have three chambers and carry more than 50 seeds. Peganum harmala is a PERENNIAL growing to 0.6 m (2ft) by 0.5 m (1ft 8in). Suitable for: light (sandy) and medium (loamy) soils and prefers well-drained soil. Suitable pH: acid, neutral and basic (alkaline) soils and can grow in saline soils. Cultivated Beds; East Wall. By. South Wall. By. Edible Uses: Condiment; Oil; Oil. Seed – used as a spice and purifying agent[105, 177, 183, 238]. Some caution is advised because the seed has narcotic properties, inducing a sense of euphoria and releasing inhibitions. An edible oil is obtained from the seed[46, 61]. Alterative[46, 169]. The fruit and seed are digestive, diuretic, hallucinogenic, narcotic and uterine stimulant[192, 238]. They are taken internally in the treatment of stomach complaints, urinary and sexual disorders, epilepsy, menstrual problems, mental and nervous illnesses. The seed has also been used as an anthelmintic in order to rid the body of tapeworms. This remedy should be used with caution and preferably under the guidance of a qualified practitioner since excessive doses cause vomiting and hallucinations. The seeds contain the substance ‘harmine’ which is being used in research into mental disease, encephalitis and inflammation of the brain. Small quantities stimulate the brain and are said to be therapeutic, but in excess harmine depresses the central nervous system. A crude preparation of the seed is more effective than an extract because of the presence of related indoles. Consumption of the seed in quantity induces a sense of euphoria and releases inhibitions. It has been used in the past as a truth drug[169, 187]. 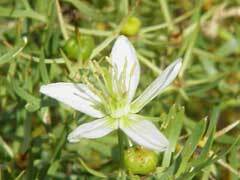 The oil obtained from the seed is said to be aphrodisiac. The oil is also said to have galactogogue, ophthalmic, soporific and vermifuge properties. The seed is used externally in the treatment of haemorrhoids and baldness. The whole plant is said to be abortifacient, aphrodisiac, emmenagogue and galactogogue. A decoction of the leaves is used in the treatment of rheumatism. The root has been used as a parasiticide in order to kill body lice. It is also used internally in the treatment of rheumatism and nervous conditions. Dye; Incense; Miscellany; Oil; Oil; Parasiticide. A red dye is obtained from the seed[46, 61]. It is widely used in Western Asia, especially as a colouring for carpets. The ripe seed contains 3.8 – 5.8% of the alkaloids harmine, harmaline, harmalol and peganine. Ineffective as a contact poison, they are active in vapour form where they are effective against algae, in higher concentrations to water animals and lethal to moulds, bacteria and intestinal parasites. The seed is used as an incense. Prefers a light well-drained but moisture retentive soil and an open position in full sun. Prefers a dry soil and succeeds in poor soils. 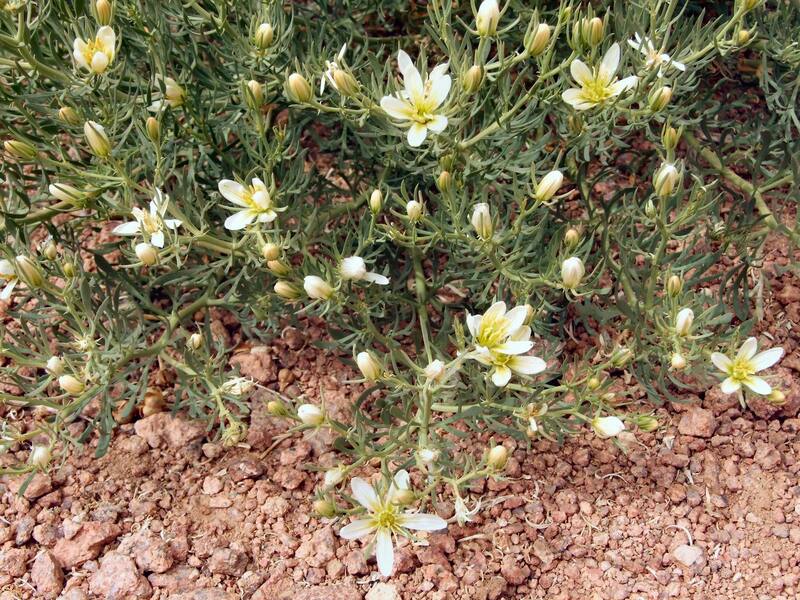 Although this species comes from dry desert areas, it responds well to cultivation so long as the soil is very well drained. It can tolerate temperatures down to about -20°c if the soil is dry. There is speculation that this plant was the sacred ‘Soma’ plant, which was used by the ancients of India and Persia as an hallucinogenic aid to understanding the deeper meaning of life. Seed – sow late spring in a greenhouse. Prick out the seedlings into individual pots when they are large enough to handle and grow them on in a sunny part of the greenhouse for their first winter. Be careful not to overwater, especially when the plants are dormant. Plant out into their permanent positions in late spring or early summer[K]. Division in late spring. The peganum harmala seeds germinate fairly reliably by scattering them thinly over the surface of normal, moist seed mix and tamping them in. Keep in a little bit filtered sun and maintain moisture. Temperature should be kept warm. We let them stay put for awhile, even if crowded, since disturbing young seedlings can be fatal. Once they seem like they have solid bases at the stem, carefully transplant with attention to the fine root hairs and adhering soil, so as not to unduly break them or bare-root the seedlings. Repot by burying a little deeper then before. Place out of full sun for awhile and water them but don’t overdo it. Seeds will continue to spontaneously sprout even years later from the sowing mix. There seems to be a narrow niche this species requires to be happy, and we have never quit found it. In the wild, despite mother bushes casting of thousands of viable seeds all summer and fall, relatively few take hold. Those young plants seen in the habitat are in specific micro climates: indentations of livestock hooves in the soil, perhaps offering more moisture and a bit of sun shadow in the print. The seeds often sprouts magnificently, only to succumb to uncertain cultivation needs. Best to use sandy mix, only water when they are obviously needing, offer a partial filter from direct mid-day sun and make sure they are warm. In natural habitat it get’s pretty cold at night, but it is during a dry season and we are told some people have great success storing their plants over winters by letting the plants actually dry up in the pots, put them in a dark, cool spot and bring them back to life in spring. We have a few old mother plants who sometimes skip a whole year without any sign of life, only to make green leaves at unpredictable times. Germination: Syrian Rue likes a well-drained not too damp and not too rich medium. 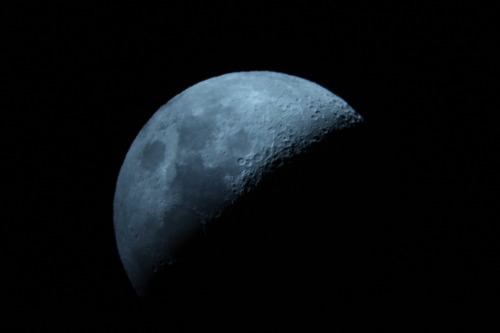 The seed flat must be kept in the dark for the seeds to germinate. The temperature should be about 21 degrees Celsius (70 degrees Fahrenheit). 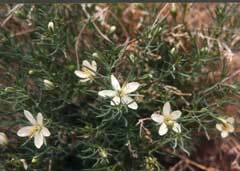 Growing: Syrian Rue needs full sun and a well-drained to dry, poor soil. If you are growing it too wet, the roots will die causing the top to go limp and die because the remaining roots can’t keep up with evaporation. If you are growing the plant too rich, the growth will be too lush and soft and become very susceptible to fungus infection and bug damage. If you grow the plant in too low light, it will produce thin stretched out soft growth that gets knocked over by any wind and also dries out too quickly during droughts. This entry was posted on June 25, 2013 by carinaragno. It was filed under flowers, gardening general info, Green Living, plant care guides, planting your garden/crops, selecting a site, small tips, starting a garden, taking care of your garden and was tagged with ancient plant, flowers and herbs, green living, medicinal plant, Peganum harmala, perennial, plant care guide, Syrian Rue.